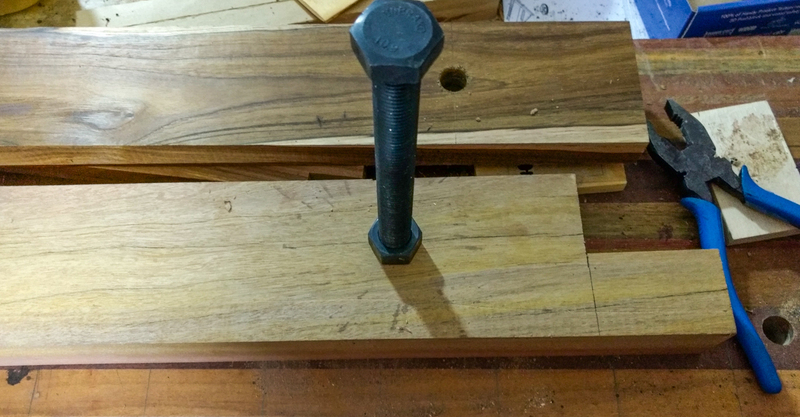 Working on the edges of bigger boards can be inconvenient if you have only a regular bench vice. 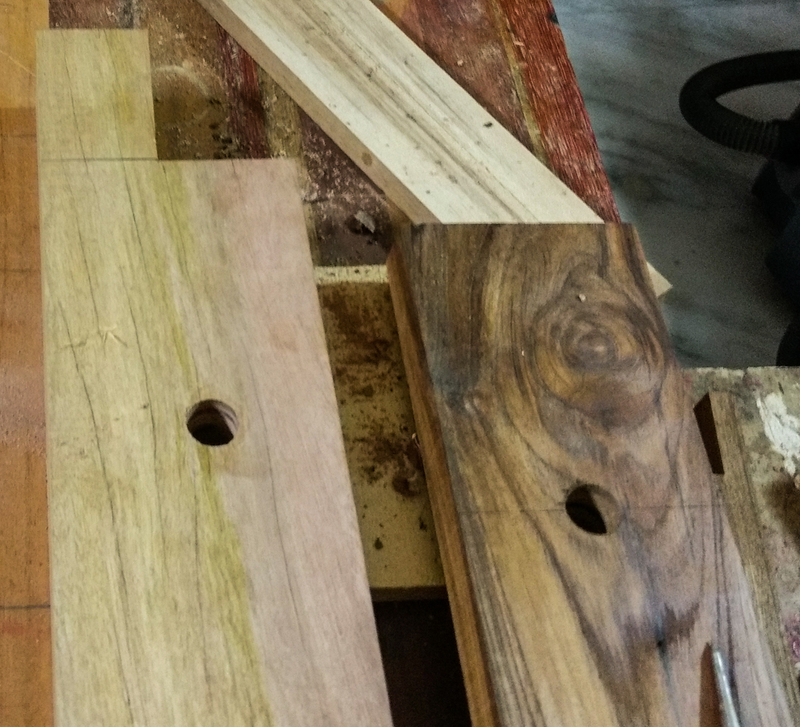 Wider boards can be held in a regular bench vice but only on one side leaving the other hanging in the air. Often the unsupported side needs something to rest on. While it is certainly not impossible to work wider boards on a regular vice it does lack satisfaction. This is where the Moxon vice comes in. I believe it was popularised some years ago by the erudite woodworker and author, Christopher Schwarz. Since then these vices have become de rigueur for the enlightened woodworker. 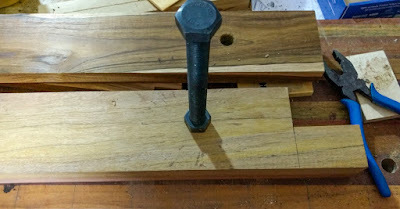 I wanted one because it was clear that such a vice would make the task of cutting dovetails on wider boards much more pleasurable than with a regular vice. The Moxon vice is simplicity itself: nothing but two planks pressed together by the action of tightening two bolts on two ends. Because the area between the two bolts can be quite wide - 24 inches or more - a wide board can very easily be slipped in between the two planks and held securely. 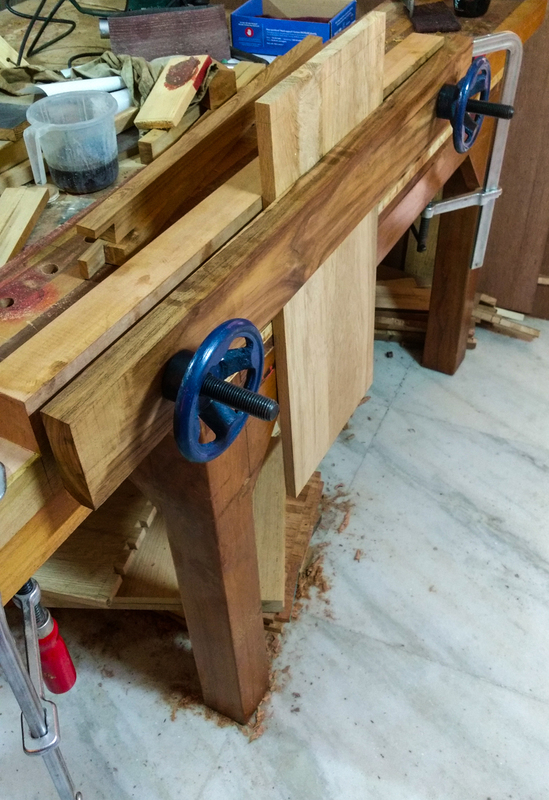 The vice is designed to be clamped on a workbench, which means it will be a few inches higher than the vices that might be attached to the workbench. These few inches, trivial as it might seem, actually allow the work to be pushed up to a much more comfortable height for actions such as sawing dovetails. The merits of such a vice were first explained to me by Dinabandhu Mitra in Calcutta. He had constructed a fearfully powerful vice, complete with chains and sprockets, that could hold massive pieces of timber without the slightest complaint. At one point, he helped me acquire some pieces of formidable hardware in the form of massive Acme threaded rods. He felt it was better to hold a piece of timber for working between two widely spaced clamping points. What he built from scratch and advocated was a massive twin screw vice. A regular vice has only one clamping axis running through its centre. While this is good enough for the vast majority of tasks, it is not ideal for some. 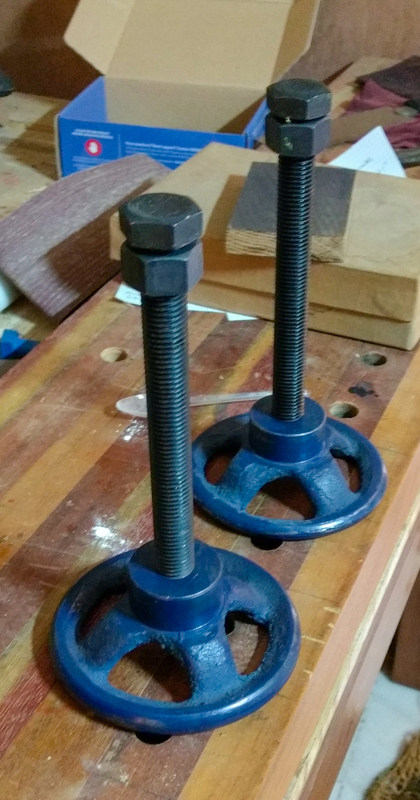 At any rate, I finally got to making one for myself yesterday thanks to a set of cast iron wheels and a set of rolled threaded bolts sent to me from Bangalore by Ashok George, who happens to be a part-time woodworker and full-time engineer designing tools at HAL. All I needed were two wide planks, which I planed down and sized. Then I drilled two holes on two ends (4 inches from each edge) through which I could pass the 20mm (not ¾ inch) bolts. 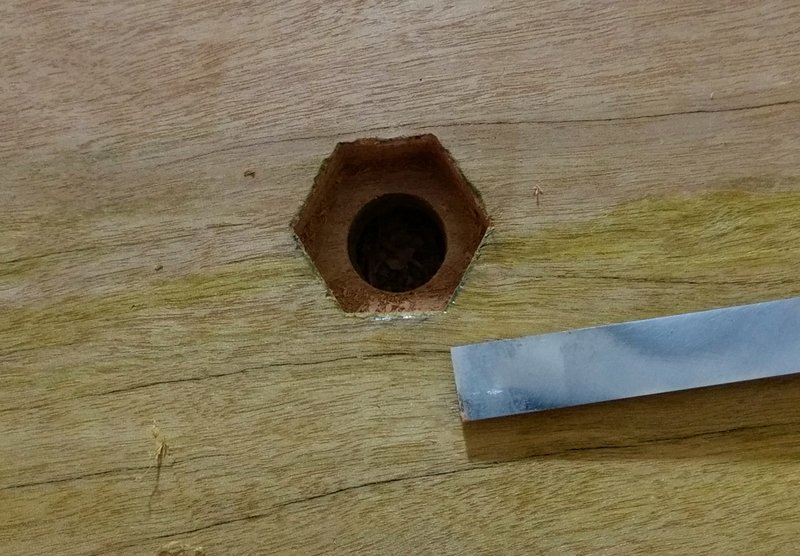 A little marking and chiselling was required to make a mortise for the hexagonal nut and that was it. The bolt slipped through and was tightened by the nut and the wheels on the other end provided the driving force. The vice is clamped to the workbench for use and can be stowed away when not required. This vice can be made in a couple of hours and costs very little. 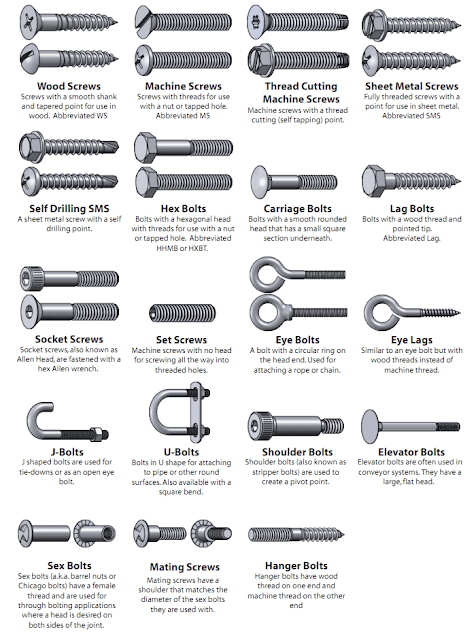 The bolts and wheels can be purchased in any steel market. The total cost of the hardware in Bangalore came to about Rs 1,200 (roughly US $ 18). Ashok procured rolled thread bolts and not the regular cut thread bolts which are cheaper. Rolled threads are smoother and harder than cut threads. But that's not such a big deal. 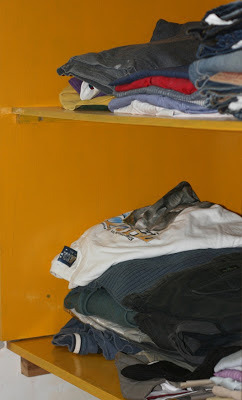 Regular threads will do just fine, and they are much cheaper. Now I find I can cut dovetails or plane the end of a wide board rather comfortably. The Moxon Vice is not an essential piece of equipment but it does make life easier. After all that is why there is a profusion of tools; not because they are all essential but because many of them make specific tasks easier, more accurate and comfortable. Congratulations on another fantastic build, I find the portability factor of the Maxon vice it's greatest asset. You can convert any table to a work bench. Great.It is very inspiring and helpful to see new things done beautifully,it truly provides immense sources of practical information before beginners like us. Really very useful as I am using it which is fixed on my workbench. Indranil, I am looking for these cast iron wheels in Bangalore. If you don't mind, can you please tell me where these cast iron wheels were procured in Bangalore. I have gone to the main market and could not find. I guess have to do more searching, but thought will check with you on this.